Following on from this post, here's another of Höfner's less celebrated guitars. The seller says this Höfner S3N dates to the 1970s or 1980s - my guess would be the 1980s simply because of the presence of Shadow pickups on this particular example. The seller also likens it to a Les Paul, which is a pretty lazy analogy because the only thing Les Paul like about it really is the single cut body design (and I'm guessing scale length too). The slab body, bolt-on neck, pickup types and control layout are all decidedly un-Les Paul like. Other than this, I am afraid I don't have much to tell you about this guitar. It certainly looks nice enough, and knowing Höfner I'd imagine it plays well; I could see using this as a general workhorse of an instrument - it's nothing too flashy or over-the-top but it looks like the kind of instrument that would get the job done without any fuss. But maybe you know differently? Currently listed on eBay UK with a Buy It Now price of £425. Looks like a crazy cross between a Gibson Marauder and its bass partner the Grabber. It shares the Marauder's combination of a contoured single-cut body, bolt-on neck, humbucker+single-coil (not angled in this case) pickup configuration, along with the Grabber's distinctive love-it-or-hate-it angular scratchplate, whose design appears to completely disregard the shape of the body. It has more in common with a Marauder than with a Lespaul! 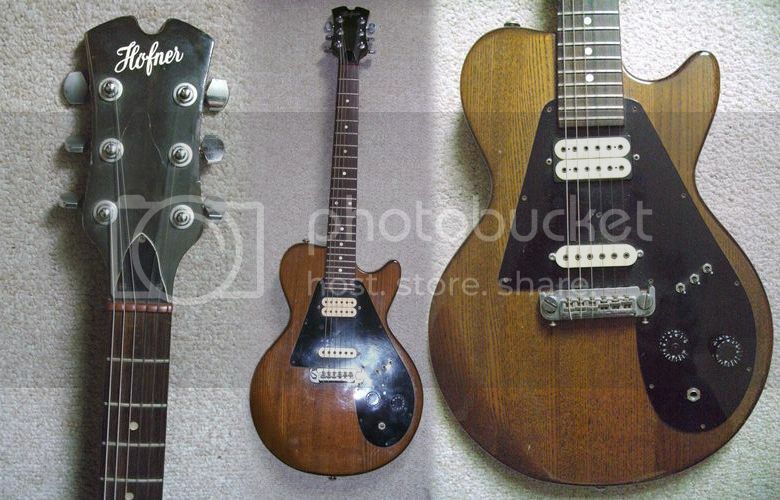 To my way of thinking, one of Hofner's daffiest guitars has to be the Razerwood (http://www.vintagehofner.co.uk/gallery/solids/sol98.html). Extremely elegant in its simplicity, but as far away from a 'conventional' Hofner design as one could even fathom.